Lose yourself all over again. Join in with #LossLit. Tweet your creative responses to do with ‘loss’. It’s been two weeks since writers Kit Caless and Aki Schilz, co-creators of#LossLit on Twitter and Storify, talked to me about this exciting and innovative project which invites and curates submissions of tweet-sized micropoems and microfictions to do with ‘loss’. You can read the post again here. 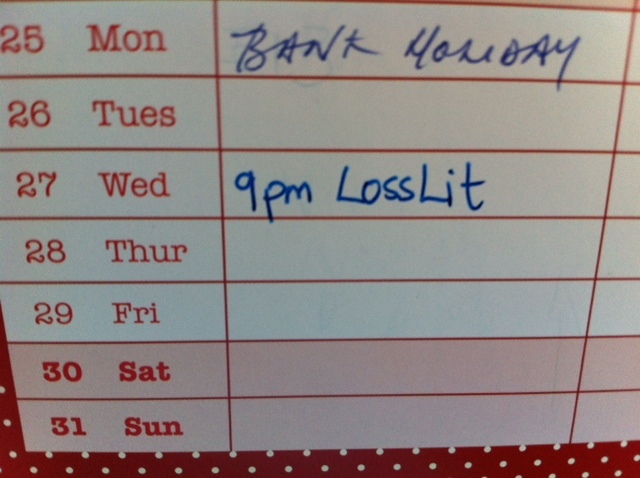 There’s another #LossLit evening on Wednesday 27th August from 9pm GMT. Without a doubt, the #LossLit evening was the best time I’ve had on Twitter in ages. It was fun, and a bit scary, to take part in a live event. Of course, you don’t have to make your miniature fictions or poems up on the spot – you could try to write them in advance – which might have made me feel less nervous. A little bit of adrenaline always encourages the creative juices to flow, though, don’t you think? but there really was no need to feel worried, there was a friendly, supportive buzz around the project and Twitter was awash with generous and appreciative ‘favourites’ and ‘re-tweets’. Childhood is something we all lose eventually, some of us much sooner than is just, as is documented in world events currently taking place. We experience the loss of our own childhood and, if we’re parents, we experience it all over again as our children grow older. My tweet has prompted me to think that this is a theme I might explore more in other writing. Then, I returned to playfulness although I was also thinking about losing hair and ageing! I went to a writing poetry workshop once when we had to write about something we missed and one lovely woman told us that what she missed most where her eyebrows which she’d plucked and which never grew back! And to end, I started thinking about my own mother, who died when I was twelve, and I thought about giving and receiving presents and what you never get if there’s nobody to buy anything for you. I thought about estrangement and what you lose when you lose touch with someone. These are only my tweets – do visit the #LossLit Storify Page to read some of the many micropoems and microfictions or follow the stream on Twitter. You don’t have to wait until Wednesday, you can read and add to the #LossLit project at any time. My thanks to Aki and Kit for a gorgeous project. I hope you take part! To leave a comment on this post, please scroll down and click on the speech bubble icon.